Given we are in the Thanksgiving season, I thought it would be appropriate to feature a record tribute to Daddy Bruce Randolph. 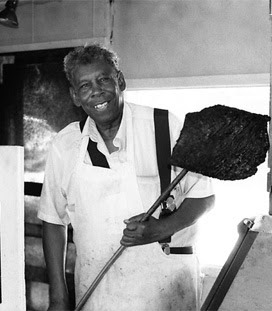 Born in Arkansas, in 1900, Randolph made his way to Denver, after years of picking cotton, and working in the neighboring coal mines--where he'd sell barbeque sandwiches to the workers. Taking the name "Daddy Bruce" (a nickname from one of his sons), he opened his name sake restaurant in 1963, at the corner of Gilpin and 34th. Four years later he would open his Five Points restaurant. He gave away clothes and food every year, on his birthday and on Christmas, held Easter egg hunts, and staged massive Thanksgiving dinners for the homeless. The first documented Daddy Bruce gang feed occurred in the late 1960, for about 200 people, in City Park. The meals grew to the point that he was dishing up thousands of turkey dinners during the holiday. 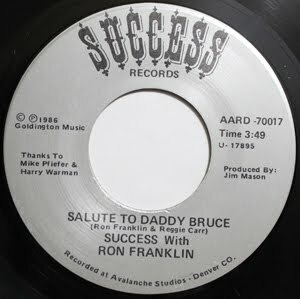 In 1986, local singer Ron Franklin recorded a rap tribute, "Salute to Daddy Bruce" (same song on the flip - Success 70017). The song featured the group Success as backup singers. The record was recorded at Avalanche Studios in Denver, and produced by Jim Mason. In 1980, his son opened Daddy Bruce Bar-B-Que, at the corner of Arapahoe and 20th streets, in Boulder (In 2012, Bruce Randolph, Jr. sold the establishment). Daddy Bruce passed away in 1994, at the age of 94. In 1985 a section of 34th Avenue, from Downing to Dahlia streets, was renamed Bruce Randolph Avenue.